Millie (1931) is a Pre-Code drama film directed by John Francis Dillon from a screenplay by Charles Kenyon and Ralph Morgan, based on a novel of the same name by Donald Henderson Clarke. The film was an independent production by Charles R. Rogers, distributed by RKO Radio Pictures, after their acquisition of Pathe Exchange. 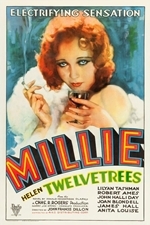 It starred Helen Twelvetrees in one of her best roles, with a supporting cast which included Lilyan Tashman, James Hall, Joan Blondell, John Halliday and Anita Louise.